Recently, the desire to write about how Kenshin Himura of Rurouni Kenshin fulfills the role of a Christ Figure has been swirling in my mind. I am unfamiliar with another article delving into the similarities between the two, though several forum goers and bloggers have touched on this idea. The two published articles I have read which discussed Kenshin’s character, Brian Camp’s in Anime Classics Zettai (every otaku should own this book) and another one in Otaku USA, both remark on the extreme nobility of Kenshin’s character. 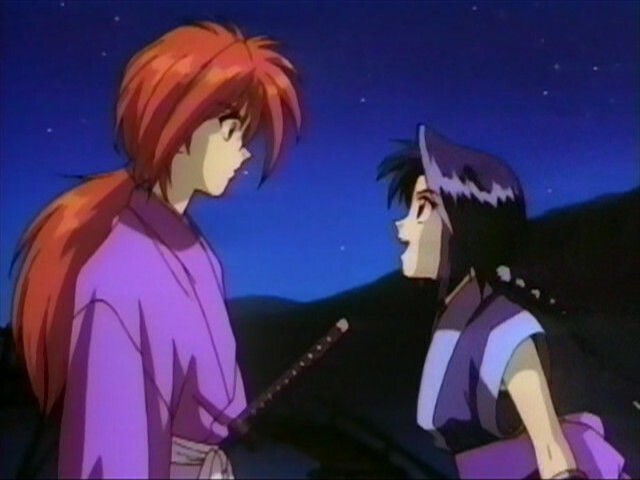 Here’s a quote from Brian Camp’s article: “In fact, Kenshin is so likeable and perfect that he runs the risk of being a little too abstract to be entirely plausible, but it’s the small human moments with the others that bring him down to earth and anchor the series in a kind of reality” (324). In a similar way, Jesus Christ stands infinitely above everyone, but loves the company of little children and performed that most human of miracles at the wedding feast of Cana. 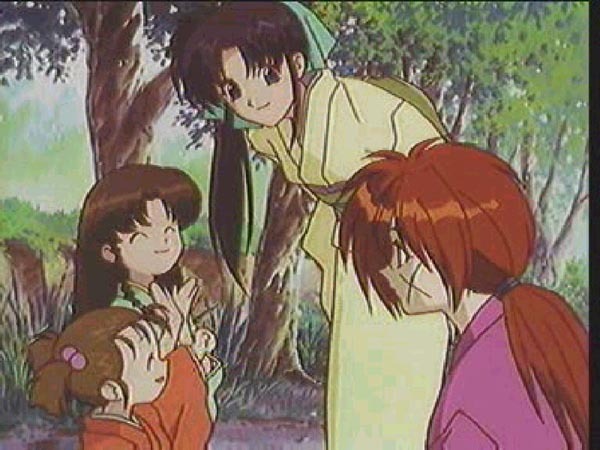 (Might as well point out here that Kenshin also loves children very much and often plays with Ayame and Suzume, Dr. Gensai’s granddaughters.) The more I consider the similarities, the more I am convinced that Kenshin Himura was not based principally on Kawakami Gensai, despite Nobuhiro Watsuki’s claim that he based Kenshin on this assassin of the Meiji Era. The physical design of Kenshin’s character may have been, but not his personality. One might as well start with the most apparent connection: they’re both wanderers. Kenshin wanders Japan, while Christ wandered Israel. Of course, we run into the difference that the former traveled in order to learn and hide from his notoriety, while the latter, the source of all wisdom and knowledge, went about publicly in order to teach. But, you can say that they were both impelled by humility: Christ humbly obeyed the will of His Father and imparted spiritual wisdom from his meek and humble heart; on the other hand, Kenshin, as a mere man who may be mistaken about his opinions, prefers to learn and encourages others to find their own way. Interestingly, the main topic on which they preach is repentance. Kenshin, a sinner like the rest of us (Few people will create a Christ figure who’s entirely flawless, after all), usually confines himself to elaborating on why he goes about repenting; but, to certain villains who are obviously in need of repentance, he’s quick to advise them to practice it themselves. The Heart of Jesus, infinitely good and perfect and therefore having no need to repent himself, constantly advises others to repent so that they might find happiness. Happiness itself is another theme about which both often speak. One might say that the ultimate goal toward which the advice and teachings of these persons is happiness; however, the philosophy of Kenshin tends toward Epicureanism. Oddly enough, this Epicurean form of happiness, at least shares a few features with Christian happiness, such as disinterest in wealth, hatred for the world, and a clear conscience. The poverty of Rurouni Kenshin‘s heroes, the disdain shown by all toward the millionaire Takeda Kanryu, and Kenshin’s lecturing Misao about the wrongness of theft–even when one is in poor circumstances–stand as sufficient examples of idea of wealth’s unimportance. Especially in Kanryu’s case, where his downfall makes it evident that “Wealth is useless on the day of wrath, but virtue saves from death” (Proverbs 11:4). 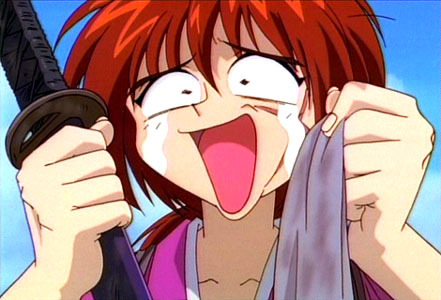 As for hatred for the world, the series has several examples of people who become corrupted through their desire for power, whether it be through physical strength or political power, and the time when Kenshin refuses General Yamagata’s offer to make him a government official show how much the characters wish to remain unstained by the world. Most of the villains who disturb Kenshin’s idyllic life at Kamiya dojo have a lust for power, and desire for power always leads to a bad end. The necessity for a good conscience is perhaps shown most clearly in the duel between Kenshin and Soujiro. 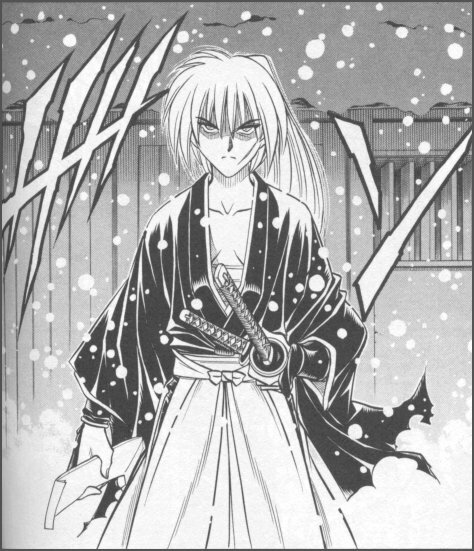 Soujiro becomes angry with Kenshin because he thinks that Kenshin is deluded in his desire not to kill. Because delusion is a sort of disease, it truly ought to make Kenshin an inferior swordsman. According to Zen Principles, any sort of delusion or anything which would disturb the purity of one’s mind should prevent the execution of good swordsmanship–especially the superior kind which Kenshin possesses! But Soujiro’s frustration at the idea that he himself might be in the wrong prevent him from overcoming Kenshin, who believes himself to be in the right. I suppose that it would be superfluous to provide examples of how Jesus advises us not to serve mammon, to avoid worldliness, and practice virtue in order to maintain a clear conscience, right? Then, we have Kenshin’s vow not to kill which reminds me of this verse: “The Son of Man did not come to condemn the world, but to save it” (John 3:17). In a similar way, none of Kenshin’s antagonists die by his hand, but rather by their own refusal to turn from their evil deeds. The two best examples being Jin-e Udo’s suicide and how Shishio’s stubbornness works his own death. As St. Faustina avers in her diary, whoever goes to hell, goes there by their own will, not because Jesus Christ wishes anyone to perish (cf. 2 Peter 3:9). And in the second season, is not Kenshin’s journey to Kyoto reminiscent of Jesus’s journey to Jerusalem? Even the true object of the journey is rather similar: just as Christ wished to put the old man to death in us so that we may have life in Christ, Kenshin wishes to put the man slayer side of himself to death. Also, Shishio is pretty much Satan, whom Christ defeated by His passion and death. Then again, Kenshin’s friends constantly remind us in this arc especially how he tries to carry everyone’s burdens on his shoulders, which–though it stands as manner he resembles Christ–is actually a fault in his case. Only God can bear everyone’s burdens. A picture of Kenshin from his days as an assassin in the Meiji Revolution. But, this is my favorite line exhibiting the similarity between the two because many are apt to miss the connection, but it really slams the fact that Kenshin is a Christ figure on one’s head. Sanosuke says: “Kenshin isn’t using the weak as food to feed his power like you [Shishio] are. He’s willing to protect their happiness and become food for their power.” This is about as inspired a line as one can find in anime. (Surprisingly, it is not found in the manga. I checked.) Essentially, this is Eucharistic imagery! Shishio, like evil, consumes those who fall prey to him; on the other hand, Kenshin is being described as food for the weak, and Christ feeds us weaklings with His body and blood each mass so that we remain in Him so “that My joy may be in you and your joy may be complete” (John 15:11). If not for Christ offering Himself as food for us, we should all fall to sin. Well, I hope that this little discussion of how Kenshin’s character compares to Jesus Christ will deepen your experience of the show! This entry was posted in Anime and tagged anime, Christ Figure, Christianity, clear conscience, disdain for wealth, Eucharistic imagery, humility, Kenshin Himura, manga, nobuhiro watsuki, poverty, religion, repentance, Rurouni Kenshin, theology. Awesome article! I really enjoyed some of the connections you made which I hadn’t though of, particularly Kenshin’s approach to Kyoto with Jesus’ journey to Jerusalem. I feel like entire posts could be written about each of the elements you mentioned. WONDERFUL stuff. Thanks! To tell you the truth, the feeling that these topics were being covered too succinctly occurred to me, but I have a fear of long posts getting the ubiquitous “TL;DR” comment. In truth, one could write a book on Christian imagery and themes in Rurouni Kenshin alone. (A project which I just might have to undertake one day.) It’s certainly one of the deepest anime ever created! I agree – you’re just skimming the surface here and indeed, a book could be written. I have a short book on the Christian themes and imagery in Haibane Renmei, and I think there are several other anime that contain enough material for a excellent book, including Rurouni Kenshin. Ah, so many people refer to Haibane Renmei when the topic of Christian anime come up. To think that I’ve yet to watch the whole thing! One day I’ll have to finish it. Good luck on writing that book. I’ll look forward to seeing it in Barnes and Noble in the future! But, it does sound tempting to write a work of literary criticism on Rurouni Kenshin. At the moment, I’m in volume 22 plodding through the original Japanese–six more to go! Then, I can go back and perform the in-depth reading and comparison to the anime necessary for a work of literary criticism; though, all the anime episodes after Shishio are going to be ignored! Oh, woops, I meant to say that the book has already been written. It’s called “Set Apart” and is available on Amazon, though it has an evangelical stance that might not be up your alley. I see. I thought that you meant that you had the material for a book, but I did find it on Amazon: Set Apart: Tsumi kara no Sukui. That’s pretty cool, and I might just pick it up! I don’t mind learning from Evangelical Christianity. I figure that if I can glean truth from pagan sources, how much easier is it to gain truth from brother Christians. And reading that work would likely make for a better viewing experience. Another juxtaposition would be resurrection. Kenshin seems to die at one point while fighting Shishio, but then rises again and defeats him. In the Revenge Arc, he “dies” emotionally at one point, but then rises again to fight on as well. I hadn’t thought of that. That would certainly make for a great connection! As me and TWWK of beneaththetangles.wordpress.com were discussing, one could write an entire book on the subject, and perhaps I will one day. Kenshin isn’t the true Christ figure in the story. If you’ve seen the third season (fillers) you’d get what I’m talking about. Do you mean the Son of God arc? I don’t remember the details of that story as much as the first two seasons–probably because I watched the third season once and the other two numerous times. But in terms of Christ-likeness, I think that Kenshin beats Shogo. But, I might have to watch the Son of God arc again to see how Shogo’s character parallels Christ’s. He might simply be a messianic figure rather than a Christ figure–or perhaps the kind of Christ whom the Jews of Jesus’ time looked for: the kind who would free them from the shackles of Rome and make Israel a great nation. That gives me the idea for another article! Thanks! Eucharistic Imagery!! Now that you mention it, I realize the excact resemblance! Jesus’ body being given to everyone as food so that they might live. “food for the weak” is also the quote that was closest to the ideals of Christianity(I felt it in my heart ) when I watched the series. It’s just that I couldn’t find a direct connection then, because plainly, it would seem that I’m just stating a forced parallelism on the two ideologies, but now that you mention the Eucharistic Imagery, it’s so similar, nobody could say “forced similarities” anymore. When it comes to finding parallels between religion and fiction, I go with what strikes me without worrying about the intention of the author. Sometimes, I later learn that the author is a Christian (such as the author of Trigun) or there are so many parallels that I can have no doubt–like with Arpeggio of Blue Steel. I wrote an article on that show which you might find fascinating. In the case of Rurouni Kenshin, I have some lingering doubts about whether Nobuhiro Watsuki is Christian, but it would not surprise me if he was. In any case, the themes in the story do tend to fall in line with Christian ethics and even theology, which I find very cool. I wrote an article for a class on Samurai X: Trust and Betrayal, which you can find on this blog. And somehow, St. Bonaventure’s Journey of the Mind into God is very useful in illustrating certain themes that OVA brings up.